Looking for some of the best furniture themes to start your online business? Here they are! We selected some of the best niche-specific WordPress themes for selling everything from furniture, decorative items, designer products and interior design services online. It’s not terribly difficult to find a theme that will help you build a decent portfolio website. “Decent” isn’t always good enough in this competitive world. You need something that will help you to build websites in the award-winning category. For this, the number of available tools to do the job is markedly smaller. All it takes to build an awesome portfolio or website is your creativity and the right tool. Such tool doesn’t place constraints on what you’re trying to accomplish. If either is missing, you’re stuck with “decent”. Your creativity is not the problem, which leaves the tool as the problem to be worked. We’ve done that for you with this selection of the best portfolio-building tools on the market. Maybe it’s time to create some awesome stuff. Do you want to take your online store to the next level? These best marketplace WordPress themes will help you easily build huge marketplace websites like Amazon, eBay or Envato. They come packed with all the necessary features for launching your marketplace site, for any kind of niche you choose. The vendors will be able to easily add a shop, products, complete received orders, track shop earnings and withdraw them using the front-end forms. You will be able to charge them commissions for each sale and watch your business grow. Here are our top picks for the best marketplace WordPress themes! Here are 25 of the best education WordPress themes on the web. 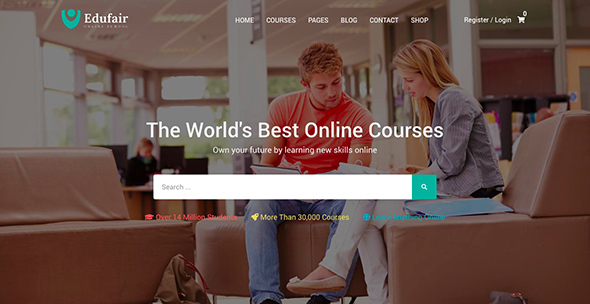 These stunning educational WordPress themes are a perfect fit for schools, colleges, universities, or simply for selling courses online. They come with modern edge designs paired with the latest web features, offering a complete experience for students and viewers. Check out their details below! If you need responsive & retina-ready WordPress themes, this is the list you need. These themes will look good on desktop, tablets and smartphones alike. They load fast and most of them come integrated with drag and drop page builders.